Lead has two charges listed, +2 and +4. This is a sample of lead (II) chloride (PbCl2). 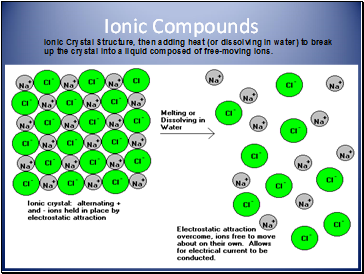 Two or more elements bonded in a whole-number ratio is a COMPOUND. This compound is formed from the +4 version of lead. This is lead (IV) chloride (PbCl4). Notice how both samples of lead compounds have consistent composition throughout? 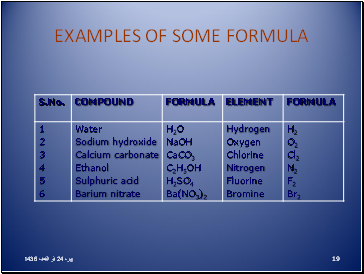 Compounds are homogeneous! 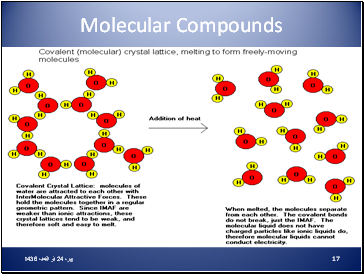 Molecular: made of nonmetal atoms bonded to form a distinct particle called a molecule. 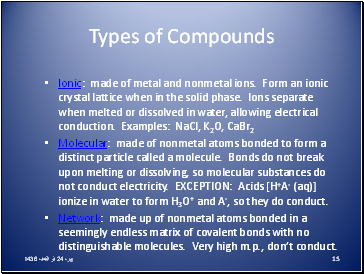 Bonds do not break upon melting or dissolving, so molecular substances do not conduct electricity. EXCEPTION: Acids [H+A- (aq)] ionize in water to form H3O+ and A-, so they do conduct. Network: made up of nonmetal atoms bonded in a seemingly endless matrix of covalent bonds with no distinguishable molecules. Very high m.p., don’t conduct. 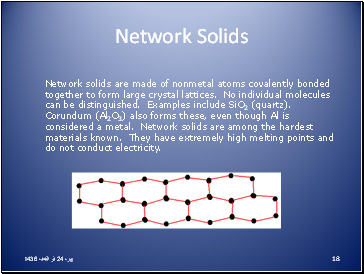 Network solids are made of nonmetal atoms covalently bonded together to form large crystal lattices. No individual molecules can be distinguished. Examples include SiO2 (quartz). Corundum (Al2O3) also forms these, even though Al is considered a metal. Network solids are among the hardest materials known. They have extremely high melting points and do not conduct electricity. 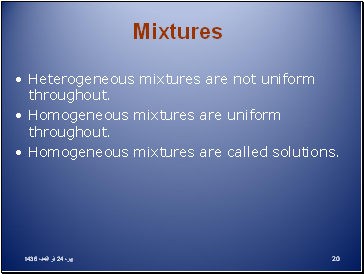 Heterogeneous mixtures are not uniform throughout. Homogeneous mixtures are uniform throughout.